John Purser's book seen above tells the story of the BBC Scottish Symphony Orchestra (BBCSSO) from 1935 to 1987, and covers in detail the attempt in 1980 by the BBC's London management to disband the orchestra. The story of how that decision was overturned following a strike by all the BBC orchestras and support from leading musicians including Colin Davis, Pierre Boulez and Carlo Maria Giulini has been told here before. 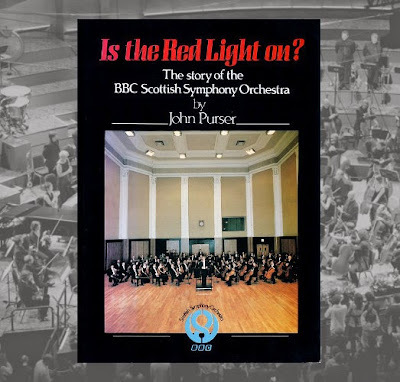 Over the years I have also recounted how, when I lived in Scotland during the 1980s, the BBCSSO played its heart out for its Stirling audiences at the Macrobert Arts Centre. Among the memorable performances I heard there was a Sibelius Sixth Symphony with Charles Groves, a Walton Viola Concert with a very young Nigel Kennedy and Mahler's First Symphony, conducted, if my memory is correct, by Jerzy Maksymiuk. More recently, as readers will know, I have spent much time with the BBCSSO recordings of music they commissioned from Jonathan Harvey, including Speakings and Body Mandala, and, in fact, Jonathan played in the back desk of the orchestra's cellos whe he was a post-graduate in Glasgow. In a 2008 post written after a incandescent BBCSSO Rachmaninov Second Symphony at Snape, I asked Is this the best British orchestra? In that post I explained how "the orchestra's Scottish location has been a positive help... it gives them a wide geographic canvas to work on in contrast to the London orchestras who work in a claustrophobic, ego-ridden and often politically toxic atmosphere". An example of that ego-ridden and politically toxic atmosphere is a piece by Norman Lebrecht titled 'Scotland will lose an orchestra ‘the morning after independence’', written, quite unashamedly, to opportunistically exploit tomorrow's Scottish independence referendum. In a forensically precise riposte to Lebrecht's Scottish fantasia, Gavin Dixon points out that: "The text that follows doesn’t mention a source for this [headline], suggesting [Lebrecht] is quoting himself". While in a comment on Gavin Dixon's Facebook page another music journalist Andrew Mellor talks about "Norman's traffic-orientated tabloid pessimism". The latter comment is supported by my Google search which reveals that there have only ever been three mentions of the BBC Scottish Symphony Orchestra on Slipped Disc, two in connection with the Scottish referendum and one when the orchestra cancelled a concert following the 2013 Glasgow helicopter tragedy. My family has wonderful memories of the years we spent in Scotland, and our daughter was born there. But Doctor Who actor David Tennant had it absolutely right when he said: "As I chose to leave Scotland many years ago, I forfeited my right to tell Scottish residents how to run the country". My respect for the BBC Scottish Symphony Orchestra is boundless, and I wish it the very best for the future. I am quite certain the orchestra will continue to flourish whatever the outcome of the referendum; because it will still have that priceless advantage of being hundreds of miles away from the claustrophobic, ego-ridden and politically toxic atmosphere of the London music establishment.